Hi Fi Racks Podium XL review | What Hi-Fi? The standard Podium came out of nowhere to claim our best hi-fi rack Award in 2009. Now it's the turn of its big brother to try and do the same when it comes to AV. There are two sizes of Podium XL: the 1400mm width on test here, and a 995mm version. The difference accounts for £100 per tier, with the larger size weighing in at £350 per section. Like the standard Podium, the XL uses a 40mm thick platform of solid oak. 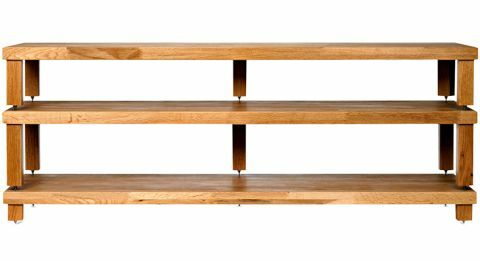 Shelf gaps depend on the height of feet specified: these can be from 65mm to 200mm. Finish is impressive, with the Podium XL coming across as a well-made piece of furniture. We do have some criticisms. It's hard to assemble the legs so that they are tightly screwed on and square with the edges. Given the mass of cabling an AV set-up has, we'd also like some thought given to neat cable management. Otherwise it's all good news - this is a great rack. We think it lets our reference kit sound even better than the smaller model, allowing it to convey a little more openness in the midrange and treble, and a touch more articulation low down. By general standards there's far more weight, dynamics and top-end refinement to our equipment than when it's place on most alternatives we've heard. The Podium XL's size means you can fit up to a 65in TV, three components side-by-side on each shelf, and easily accommodate a large centre speaker. If that suits your needs, look no further.